Inês Costa is part of the Corporate Communication and Marketing Unit. She works closely with funded scientific projects developed at and with INL, being responsible for the design and implementation of the Communication Strategy. Inês is also involved in corporate initiatives of strong integrative character, such as the Scale Travels (program oriented towards the convergence between both Arts and Science spheres). 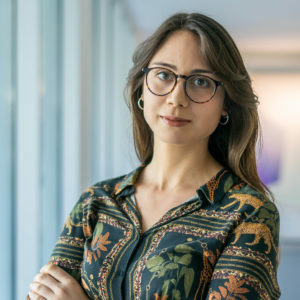 Graduated in Communication Sciences and Post-graduated in Marketing and Strategy by University of Minho, before joining INL in 2017, Inês Costa was involved in the development of digital marketing strategies for e-commerce companies settled in India and Spain.